Tuesday June 14th 1921 Hattie and myself with Lucy Evans (class of 1876) who had been here all night went to town with Cora. We went to the Exercises on the Campus and later to the dinner. We came home with William in time to have a little visit with Will & Emily before they left for home. We then came home to get some supper. I had a letter from Lydia and wrote to Ida before dark. Wednesday June 15th 1921 I did not do much of any thing in forenoon and soon after dinner. Rob & Cora took Frank Woolf and wife with myself for a nice Auto ride. Hattie & Fannie went to a luncheon at Alliene Johnstones. There was a heavy shower to the north at supper time. 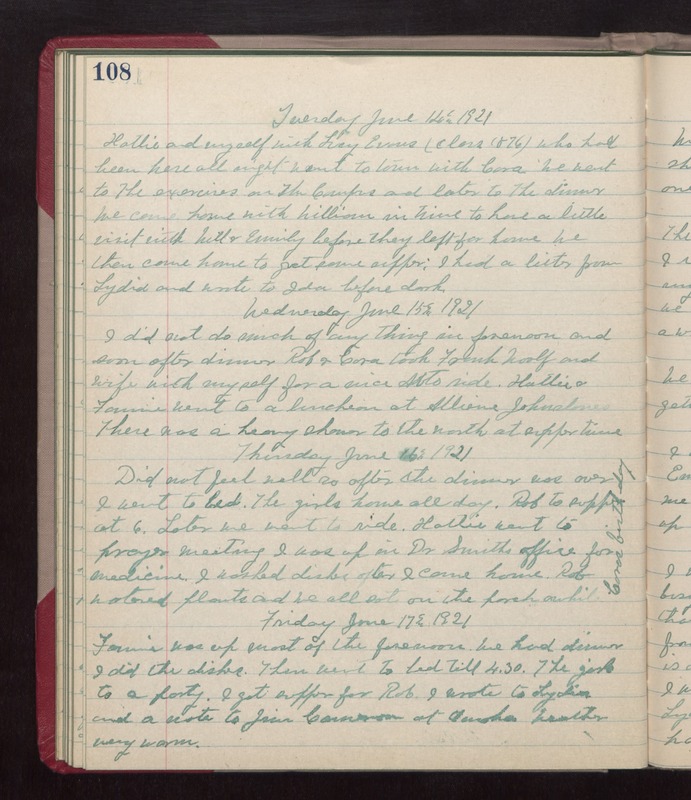 Thursday June 16th 1921 Did not feel well so after the dinner was over I went to bed. The girls home all day. Rob to supper at 6. Later we went to ride. Hattie went to prayer meeting. I was up in Dr Smiths office for medicine. I washed dishes after I came home. Ron watered plants and we all sat on the porch awhile. Coras birthday. Friday June 17th 1921 Fannie was up most of the forenoon. We had dinner. I did the dishes. Then went to bed till 4.30. The girls to a party. I got supper for Rob. I wrote to Lydia and a note to Jim [Cameron?] at Omaha. weather very warm.